Oct. 22, 2017 12:10 p.m. 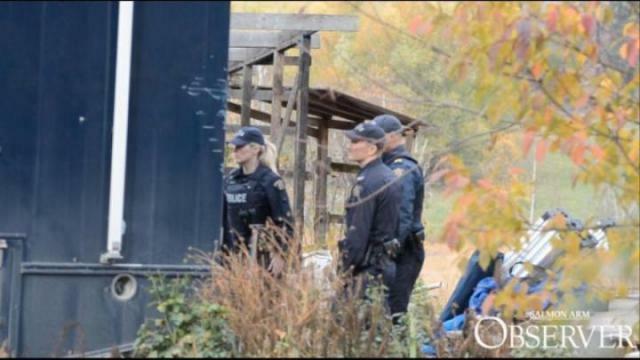 The communities of Silver Creek and the Shuswap are reeling with the news of the extensive search taking place at the Salmon River Road property and the news of the discovery of human remains on that site. The majority of charges against Sagmoen, who was born in 1980, stem from an incident in Falkland on Aug. 27. Sagmoen’s address is listed in the phone book as 2290 Salmon River Road. RCMP began a search of that property on Thursday, Oct. 19. Black Press has learned Curtis was living with his parents, Wayne and Evelyn Sagmoen, on a semi-permanent basis. Neighbours of the property indicate Curtis was known to leave for work in either Northern Alberta or B.C. for periods of time and then return to the home and help with farm work. Both the father and son share the same name, with the father commonly known as Wayne and the son going by Curtis. A neighbour who also notes her family was friends with the Sagmoen family, including Curtis, says they are in complete shock at what is happening at the property and the confirmation of human remains being found on site. The neighbour says the family farm, which is about 27 acres in size, was a source of revenue for the family, with some horses, cattle, chickens and even a couple of buffalo. Black Press has learned RCMP have brought in outside contractors to care for the animals as none of the residents are being permitted to live on the property at this time. The neighbour describes Curtis as “a bit rough,” skinny with light brown hair, blue eyes and approximately 5-foot-seven in height. She says Curtis never showed serious signs he was a drug addict or acted in strange or threatening ways. The RCMP’s description of the suspect in the threats case stated: the man is five-foot-six; weighs 140 pounds with blue eyes and dirty blond hair. Curtis Sagmoen was born in 1980, making him 36 or 37-years-old, depending on his birth date.